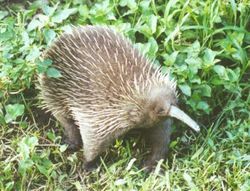 Tachyglossidae, commonly referred to as Echidnas, and sometimes also referred to as "spiny anteaters", are the only surviving monotremes apart from the Platypus. The four surviving species, native to New Guinea and Australia, all belong to the Tachyglossidae family. The echidna is named after a monster in ancient Greek mythology.